The wide distribution of CCT scanners has led to a faster and more reliable diagnosis of SAH. Furthermore, the possibility arose to determine the amount of blood and its anatomical distribution exactly. Therefore, a variety of methods has been proposed to measure the amount of blood after aneurysm rupture based on CCT. Sano, Kanno and Shinomiya (1982) measured the density of a given point in the subarachnoid space in Hounsfield units. Other research groups recorded the thickness of the blood layers in the basal cisterns (Forssell et al., 1995; Gurusinghe and Richardson, 1984; Fisher, Kistler and Davis, 1980). While some scoring systems only quantified the amount of blood in the basal cistern (Hasan and Tanghe, 1992; Hijdra et al., 1990; Gurusinghe and Richardson, 1984), the CCT grading system by Fisher, Kistler and Davis (1980) also takes the presence of intracerebral hematoma and/or intraventricular blood into consideration. 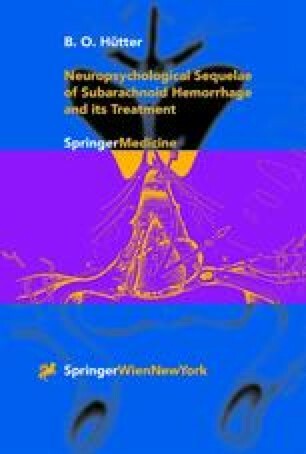 On the other hand, the Fisher CCT grading confounds the amount of subarachnoid blood and the presence of intracerebral and/or intraventricular hematoma. However, a separate listing would be more desirable.